Do you like read book? Are you a book collector? I was but I am not now, so when I give up reading book I could not find a good way to circle use these books, I do not have enough friends who want them. 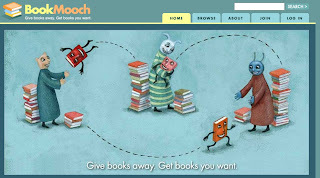 Bookmooch maybe can help you to get rid of these books. It is an online book exchange community, that allows you post your book list which you want give away, and if other people want them you can mail it. Also, you can check or ask a book that you like keep. It is a good way to get rid of your old book and add new one.